Adventure Tourism is rapidly evolving as visitors seek experiences which connect with the environment, history and culture of the area. Increasingly, a tourism product is what you buy; an experience is what you remember. 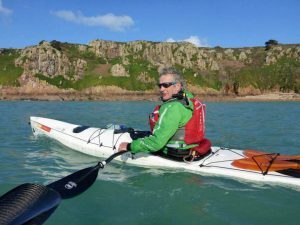 To meet these changes, Derek Hairon at Jersey Kayak Adventures has added to his extensive portfolio of sea kayak awards and experience to become the first Nationally endorsed British Canoeing guide in Jersey. Any kayaker can access guide modules as stand-alone units, and you do not need to have a coach or leadership award. Guide modules are an excellent way for paddlers to develop their knowledge and experience. The guide endorsement supports and recognises the additional skills required when fulfilling a guiding role on sea kayak tours and expeditions worldwide. To become a British Canoeing endorsed kayak guide candidates undergo training in 3 key areas. Currently, you must complete a minimum of three modules. Plus, have a paddle-sport leadership qualification (e.g. sea kayak leader) and submit a detailed portfolio of their guiding experience. Derek’s experience and qualifications allow Jersey Kayak Adventures to market training courses for local and overseas sea kayakers to become British Canoeing endorsed kayak guides. Along with Sea Kayak Leader training and assessment courses we can now offer paddlers the opportunity to complete the following one day British Canoeing Guide endorsement modules. Contact us for Sea Kayak Guide training courses and British Canoeing guide modules.